Will this crawl when fired? For sure! This high-Alberta-Slip glaze is shrinking too much on drying. Thus it is going to crawl during firing. 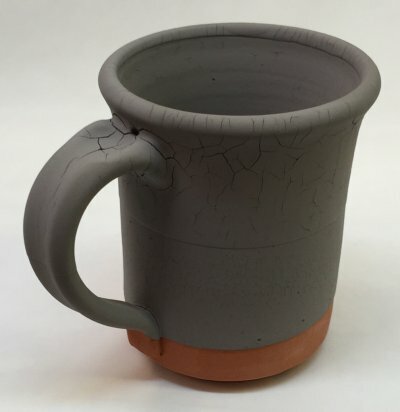 This common issue happens because there is too much plastic clay in the glaze recipe (common with slip glazes). Clay is needed to suspend the other particles, but too much causes the excessive shrinkage. The easiest way to fix this is to use a mix of raw and calcined Alberta Slip (explained at albertaslip.com). The calcined Alberta Slip has no plasticity and thus much less shrinkage (but it still has the same chemistry). Many matte glazes have high kaolin contents and recipes will often contain both raw and calcined kaolin for the same reason.